However, there is at least one vicarious Ernest Hemingway connection to Lake Chapala via Mary Duff Stirling (Lady Twysden) who lived in Chapala with her husband, the American artist Clinton King (1901-1979), for about three years in the early 1930s. The British-born Twysden had first met King, her third (and final) husband, in Paris in 1927, where their mutual friends included Ernest Hemingway, F. Scott Fitzgerald and Pablo Picasso. King was nine years her junior. Born in Texas, he was heir to his family’s candy company fortune. Shortly after they first met, Twysden moved in to live with King at his studio. Before meeting King, Twysden had had a troubled time as regards relationships. Born Dorothy Smurthwaite in Yorkshire on 22 May 1892, she had changed her name to Mary Duff after her parents divorced, using her mother’s maiden name (Stirling) as her surname. Her first, brief, marriage, to Edward Luttrell Grimston Byrom, ended acrimoniously when she was unfaithful. A couple of years later she became Lady Twysden when she married Sir Roger Thomas Twysden, a naval officer and Baronet. When this marriage also ran into trouble, she moved to Paris with a cousin to live the high life, surrounded by the literary and artistic creme de la creme. Twysden “embraced the new liberated woman role of the 1920s and pictures show a tall, thin boyish woman with hair cropped close to her skull, wearing rakishly tilted hats.” (Parker) She was the archetypal Paris flapper according to contemporary press reports and Hemingway was very much part of her social circle. It was a circle that drank hard and partied hard. Twysden liked men, especially if they paid her bar tab. Hemingway lusted after Twysden but, since she was friends with his wife (Hadley), she refused to reciprocate his feelings. She did have a fling with writer Harold Loeb and they accompanied Hemingway, his wife and a group of friends to Pamplona in 1925 to see the Running of the Bulls. The characters and experiences on this trip became the subject matter of Hemingway’s first major novel, The Sun Also Rises (1926), in which Twysden was immortalized as the character Lady Brett Ashley. Twysden divorced Sir Roger in 1926 and married King, in secret, in London in August 1928. King’s family disapproved and King lost both his allowance and his inheritance. The couple lived briefly in New Mexico before opting to move to Mexico in about 1930. They lived in Mexico for the next three years, mainly at Lake Chapala but also, briefly, in Pátzcuaro. Bernice Kert quotes King as describing their time in Chapala as more purposeful than their life in Paris: “We lived a different life from the rather senseless Montparnasse days. I worked all day at painting while Duff drew her amusing sketches in watercolor, or posed for me, or read a great deal.” They became good friends with economist-author Stuart Chase and his wife who visited Lake Chapala for a vacation. The great American poet Witter Bynner, a long time resident of Chapala, knew the Kings well and his double sonnet about them, entitled “Expatriates”, was published in Guest Book (1935), his collection of masterful sonnets about his friends and acquaintances. In summer 1933, the Kings left Mexico for New York, and then settled in Santa Fe, New Mexico, where Twysden died of tuberculosis on 27 June 1938, barely 46 years of age. Despite Hemingway’s claims that her casket had been carried by all her former lovers, there was no funeral; Twysden’s body was cremated and the ashes given to her loyal and devoted husband, Clinton King. Twysden was portrayed by Ava Gardner in the 1956 film version of The Sun Also Rises and by Fiona Fullerton in the 1988 miniseries, Hemingway. Lesley M.M. Blume. 2016. 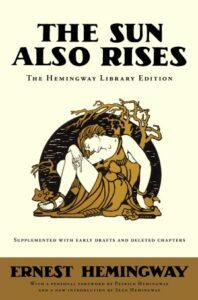 Everybody Behaves Badly: The True Story Behind Hemingway’s Masterpiece The Sun Also Rises. Eamon Dolan/Houghton Mifflin Harcourt. Bernice Kert, 1983. Hemingway’s women. W.W. Norton & Co.
James Kraft. 1995. Who is Witter Bynner? University of New Mexico Press. Mrs. Parker. 2004. “Great Novels of the 1920s: The Sun Also Rises,” by Mrs. Parker (copyright Michele Gouveia).